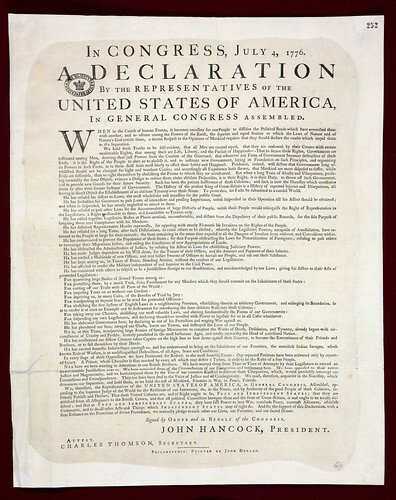 This copy of the Declaration of Independence was found by an American antiquarian bookseller carrying out research at The National Archives in 2008. The poster-sized document was hidden among correspondence from American colonists that had been intercepted by the British in the 18th century. 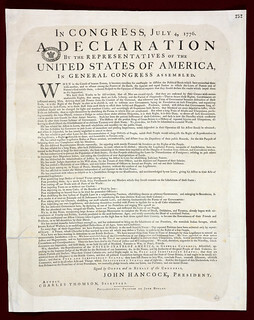 The discovery of the Dunlap print of the Declaration of Independence, printed on July 4 1776, brings the total of known surviving copies worldwide to 26. The Dunlap prints were the first official printings of the Declaration of Independence and were named after John Dunlap, the printer whose name is given at the bottom of each copy. It is likely that only around 200 of these copies were ever printed. The United States Declaration of Independence was a statement adopted by the Continental Congress which announced that the thirteen American colonies then at war with Great Britain were now independent states, and no longer a part of the British Empire. The prints made by John Dunlap were delivered to the founders early on the morning of July 5 1776. One copy was officially entered into the Congressional Journal and the additional copies were distributed, some by horseback, throughout the colonies to be read aloud to colonists and the militia. The last discovery of a Dunlap declaration was at a flea market in 1989, and it sold at auction in 2000 for $8.14 million.